Chandra Narayanaswami is currently a Principal Research Staff Member working on Blockchain and Supply Chain at IBM Research. From 2008-2016 he was actively involved in core science and technology for several areas of AI-based commerce including real-time personalized customer engagement solutions, local events based marketing kit, alternative and dynamic points of commerce, next-generation supply chains, omnichannel inventory and order fulfillment optimization, and retail/mobile payments. His past work also includes the Linux Watch, SoulPad, and Personal Mobile Hub that included medical monitoring applications, Inverted Browsers (essentially hybrid mobile app model where the browser is included in the app), a navigation system that was the first to provide photographs along with route information, and OpenGL graphics standards. Chandra has authored more than 40 scientific papers, and served as Guest Editor, Associate Editor in Chief of IEEE publications, and as General Chair and Program Committee Member of numerous ACM/IEEE conferences. He holds approximately 100 US Patents and was twice named an IBM Master Inventor. 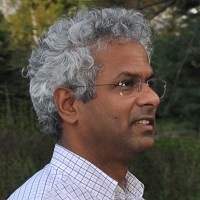 He has a PhD in Computer and Systems Engineering from Rensselaer Polytechnic Institute and a BTech in Electrical Engineering from the Indian Institute of Technology, Bombay. He's a Fellow of the IEEE and a Member of the IBM Academy of Technology and the IBM Industry Academy.